• PLOT SUMMARY: Cover by IAN CHURCHILL. CODE RED: Part 2 of 4 - "Collision" Written by JEPH LOEB. Art by IAN CHURCHILL. 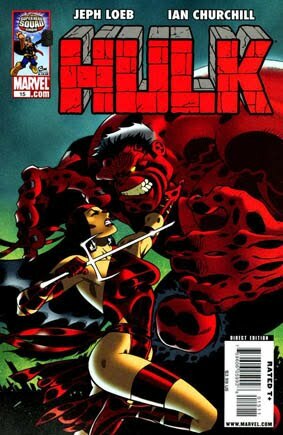 The battle you've been waiting for: THE RED HULK VS. WOLVERINE. Plus: Deadpool! Elektra! Punisher! vs. X-Force! Plus: a tale of the colorful Hulks by Audrey Loeb & Dario Brizuela. All this and a shock ending that will have all of Marveldom twittering!